Harvested flowers are graded, mostly by size. Miura et al. (2000) showed that lower grade (smaller) flower bunches generally did not last as long as higher grades with the most likely reason being that the smaller stems in the lower grades have less stored food at the time of harvest. Preharvest factors like greenhouse covering (glass is better), plant age (older is better), cultivar and time of year (fall is best) all can have significant effects on postharvest flower life. Red colored flowers can be 20F warmer than white colored ones when both are exposed to direct sunlight. Bud-harvested flowers can be stored for up to 4 months at 31-33 F. Normal storage is best at 32-34 degrees F. Flowers should be treated with STS, MCP, AOA, or AVG propr to storage. Ingestion may cause minor illness, frequent handling may cause dermatitis, calyx splitting is an occasional problem. The name carnation is from the Latin “carnis” meaning flesh, alluding to the pale pink color of the flower. In Greek Dianthus means the flower of Jove. The scientific name is from the Greek “dios” (divine) and “anthos” (flower). 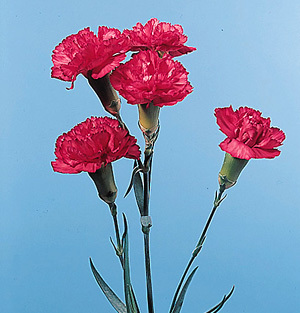 Carnations are graded according to stem length and flower number for spray types. While they seemingly never wilt, they do suffer from water stress with a resulting increase in ethylene sensitivity and/or production and the damage induced by this gas. While genetic engineering claims all of the headlines, Onozaki et al. (2001) showed that time-tested plant breeding activities resulted in less ethylene sensitive cultivars that have about twice the vaselife of traditional ones. Schade et al. (2001) found that flower fragrance levels were higher when flowers died naturally compared to those that died prematurely due to ethylene. Byun and Kim (1998) showed that the tighter the flowers are harvested, the higher the sugar level should be in the opening solution and the higher the light levels in the opening room. Verlinden and Garcia (2004) showed that treating carnations with 2 or 5% sucrose continuously or with a 10% pulse treatment for 24 hours increased flower life, decreased ethylene production and decreased flower sensitivity to ethylene.